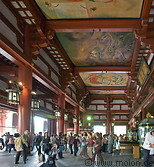 The Senso-ji Kannon temple in northern Tokyo's Asakusa district is the most revered Buddhist shrine in Tokyo. The first temple for the Kannon deity was set up in 645 AD. The temple withstood the earthquake of 1923 but was largely destroyed in World War II and was subsequently rebuilt. Access to the temple takes place through a long alley lined with shops (socalled "shopping street") which leads to the Hozomon main gate. On the temple compound are a number of pagodas and buildings.